Former U.S. Secretary of State and former Personal Envoy of the U.N. Secretary General to Western Sahara, James A. Baker III discusses the protracted conflict in Western Sahara with host Mishal Husain. MISHAL HUSAIN: Secretary Baker, welcome to WIDE ANGLE. James A. Baker III is a former U.S. Secretary of State and former Personal Envoy of the U.N. Secretary General to Western Sahara. 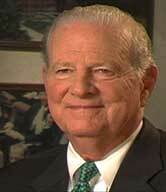 JAMES A. BAKER III: Thank you. MISHAL HUSAIN: Now Western Sahara is a part of the world that very few Americans get to see. You’ve actually been there. What are your impressions of the land and its people? JAMES A. BAKER III: Well, I’ve been both to Western Sahara proper and to the camps. It’s of course mostly desert, it is the Sahara. We have now a program of family visits that is a confidence-building-measures program that is being undertaken with the help from the United Nations human rights people and other U.N. agencies. MISHAL HUSAIN: But what was it about this conflict that made you want to get involved with it? JAMES A. BAKER III: Well, when Kofi Annan talked to me back in 1997 about possibly helping him out with Western Sahara. I said, Kofi, Western Sahara is not something that was at the top of the agenda when I was Secretary of State. In fact, I don’t think the issue ever made it to the seventh floor during the four years I was Secretary of State. But if you’ve been privileged, as I was, to be Secretary of State of the United States and you get the conflict resolution experience that I got, I think you have an obligation to use that to help people if you can. MISHAL HUSAIN: And you ended up spending seven years? JAMES A. BAKER III: And I ended up being the personal envoy of the Secretary General for seven years. During that time I convened 14 formal meetings of the parties on three continents and on any number of informal meetings of one party or the other. We put a lot of plans on the table. Three or four different proposals including the settlement plan, which had been agreed to by the parties back in 1991 when Javier Perez de Cuellar was the U.N. Secretary General. MISHAL HUSAIN: Now in the film we see the Sahrawi people, we see Abdullah, for instance, longing to go back to his old home. Was the Sahrawi people’s plight something that you felt quite strongly about? Do you feel that, that they’ve suffered an injustice perhaps or that they have a right to self-determination? JAMES A. BAKER III: Well if you’re going to be a non-partisan, an unbiased mediator you don’t take on one of these issues with a preconception about that thing. But it is certainly true that the Sahrawi people are in very bad shape living in those refugee camps, subsisting entirely on donations from private voluntary organizations. And, of course, what we were seeking to do was to find a political solution if we could, that would provide for self-determination as the U.N. Security Council resolutions require and give these people at least a shot at self-determination. When I first took the job on I was led to believe that the conflict was ripe for some sort of autonomy-based solution where the Moroccans would give self-government to the Sahrawi, the conflict would be resolved, the people from the camps would move back into the territory itself, and they would be given a liberal degree of self-government. I worked very hard on that for the seven years. We were never able to accomplish that. MISHAL HUSAIN: Why was it so hard then to get the basic vote in? Surely that was the most fair way to deal with it; this referendum was promised for thirteen years. JAMES A. BAKER III: Well you have to go back to 1991 under Javier Perez de Cuellar, the U.N. Secretary General. He put something on the table called the settlement plan to which both the Sahrawi’s POLISARIO Front and Morocco agreed, which called for a vote based on a Spanish census of 1975 or 1976. The closer we got to implementing the settlement plan – and we got quite close, in fact, we got a code of conduct for the election agreed to right here in Houston at the Baker Institute, we got the Houston accords agreed to. The closer we got, the more nervous I think the Moroccans got about whether they might not win that referendum. MISHAL HUSAIN: Do you blame them then for the fact that ultimately your plan failed and you’re no longer … ? JAMES A. BAKER III: Well, wait a minute — now you’re jumping ahead. I was talking about the old plan, the 1991 plan. Now, let me tell you about my plan, which is still on the table, called the Peace Plan for Self-Determination of the People of Western Sahara. That plan changed the settlement plan, which Morocco had decided they were no longer going to try and implement in this way. It broadened the electorate so that everyone in Western Sahara would have the right to vote on this issue of self-determination on the referendum and not just the people who were identified in the Spanish census of 1975 or 1976. And even under that arrangement, now that plan, by the way, was unanimously approved by the Security Council Resolution 1495, and the Moroccans concluded that they weren’t even willing to risk a vote under those circumstances. And, of course, that made it impossible to reach a solution to which both parties would agree. The Security Council has never been willing to impose a solution, that is, to move to Chapter 7 of the U.N. Charter from Chapter 6, which requires consensus of both parties. MISHAL HUSAIN: Is that why ultimately you decided it was time to step down? Did you feel you couldn’t do anything more? JAMES A. BAKER III: Well, I’d done everything in the world I think I could do in seven years and so I thought well maybe let’s let somebody else have a shot at this. I did this for seven years as a volunteer. I would not accept any compensation for it and, in fact, didn’t even ask that all of the expenses be reimbursed. So I put a lot — before the Peace Plan for Self-Determination, we had the Framework Agreement. We had the Settlement Plan. There was any number of different approaches tried during that seven-year period. MISHAL HUSAIN: Some of Sahrawi might feel, perhaps, that you let them down because actually the reality of their lives and their problems goes on and possibly their best chance of getting this solved was the profile that you brought to it. JAMES A. BAKER III: Well that may be so, but I don’t think you’re going to find that, you go talk to some of them. I think they will acknowledge to you that I stayed much longer than they originally expected that I would stay. I certainly know this, that I gave it my best and I tried everything I knew to try. MISHAL HUSAIN: How much of a fact during the whole dispute is the question of oil? We’ve now got the first indications from various oil companies that there are probably commercially viable oil fields off the coast. Do you think that does make it harder to solve this dispute because the stakes are higher? JAMES A. BAKER III: I’m not sure it makes it harder. The dispute was there beginning in 1975. And the dispute is going to be there regardless I think of the discovery of minerals. In fact, if there is some indication of economic production and viability it might even make it easier in the final analysis to find some mutually acceptable political solution. But the real issue is whether or not no country on the Security Council is going to expend political chips on the issue of Western Sahara. That’s what makes this so difficult because the profile of the issue is so very low and they’re not going to want to risk alienating either Morocco, on the one hand, or Algeria, on the other, by taking a firm position. And they’re not willing to ask either or one or both of the parties to do something they don’t want to do. MISHAL HUSAIN: But on the oil question, Morocco is a big importer of oil and it’s also a party in this dispute. With the sense that this region is even more valuable than just on the mineral rich side of things which it had been before. Doesn’t that make Morocco probably more determined to hang on to it and make the chances of settling it more difficult? JAMES A. BAKER III: Well I find that hard to believe because Morocco is absolutely determined to hang on to it. It’s an issue that inside Morocco there is no dissent with respect to it. Everybody, every political party, everybody from every shade or persuasion will tell you that the Sahara is Moroccan. Period. That’s it. JAMES A. BAKER III: No, that’s ridiculous. MISHAL HUSAIN: Was it something that got you interested? JAMES A. BAKER III: That’s absolutely ridiculous. I was asked to do this by the Secretary General. I told you why I did it. I did it because if you’re fortunate enough to be Secretary of State of the United States and have the experience in conflict resolution that I have and you can maybe do some good for some people on both sides of the dispute, you ought to do it. MISHAL HUSAIN: Is it a reason, perhaps, for the United States to be interested in the region? This is a time where we’ve got problems in the Middle East. Is the oil issue in West Africa a reason for the United States to take more of an interest in Western Sahara than it might otherwise do because of that potential? JAMES A. BAKER III: I don’t really think so. I mean you’ve got the POLISARIO Front giving leases to Australian companies. You’ve got Morocco giving leases to other companies, some in Europe some in the U.S.. It might highlight the profile of the issues somewhere down the line if they make any discoveries. They haven’t yet, as far as I know. I don’t think they made any major discoveries. MISHAL HUSAIN: You spoke a moment ago about getting the Security Council interested. Do you think in an age of the war on terrorism perhaps the fact that there are suspicions about terrorist activity in southern Sahara might change that? That there might be a sense, perhaps, that this is a region to watch closely, you don’t know what might happen there. JAMES A. BAKER III: Well, that’s possible. I think that may very well be possible. There is some concern about, as you say, terrorism in southern Sahara, but the truth of the matter is that both Algeria and Morocco, who are the two chief protagonists here, are cooperating, particularly with the United States, in the war on terror. So it’s a difficult issue for the United States, more difficult for the United States, perhaps, than other countries because the United States wants to remain close to both Morocco and Algeria. MISHAL HUSAIN: Could the terrorist activity in southern Sahara spill over into Western Sahara? Because the U.S. army was talking in April this year about Muslim extremists moving into these massive open spaces saying that they are as elusive there as if they were out at sea. JAMES A. BAKER III: It’s conceivable. I think there’s some in northern Mauritania now, there’s some activity — and in sub-Saharan Africa. So I suppose it is possible. There are great vast, vacant open spaces in very, very harsh environments. MISHAL HUSAIN: It would be easy for people, presumably, to hide as well? JAMES A. BAKER III: Well, Afghanistan really wasn’t ignored. We were supporting the mujahideen against the Soviet occupation, we certainly didn’t ignore it. MISHAL HUSAIN: But in the period after that and before 9/11? JAMES A. BAKER III: The period after that with the growth of the Taliban, yeah, perhaps so. But this is a really low intensity, low level dispute. Look, there’s no action forcing event in the Western Sahara conflict. Morocco has won the war. She’s in possession. Why should she agree to anything? And so she is disinclined to do so. Well, there’s one very good reason why she should, because she will never receive the imprimatur of international legitimacy for her occupation of the territory unless she works out some arrangement that is blessed by the international community, blessed by the Security Council, or acceptable to the other party. That’s why we work so very hard on the idea of an initial autonomy arrangement with self-government and then a referendum at the end to meet the test, the requirement of the Security Council for Self-Determination. MISHAL HUSAIN: I think one of the really striking things that we see in the film and really extraordinary in many ways is how sophisticated a society the Sahrawi actually have. They’re living in refugee camps but they have 95 percent literacy. They have a democratic form of government. And the role of women is very prominent. JAMES A. BAKER III: That’s correct and they will tell you that they have never resorted to terror, that they will never resort to terror. They will tell you that they want to form a society which will be at peace with all nations including Israel. I mean they make these statements. MISHAL HUSAIN: That’s extraordinary in the Arab and Muslim world. JAMES A. BAKER III: Yes. MISHAL HUSAIN: Isn’t that a society that we should be championing? JAMES A. BAKER III: Well you got to balance that against the interest that we have in maintaining close relationships with Morocco and, of course, with Algeria. We’re sort of on the horns of a dilemma there. On the other hand, from a strictly human-rights standpoint and from the standpoint of the right of all people to self-determination, the answer to your question is yes. MISHAL HUSAIN: So, Morocco and Algeria to the United States, or perhaps to the international community, are more important why? Because of radical Islam? JAMES A. BAKER III: Well, they’re joining in the fight against terror. They’ve helping the United States significantly, both of those countries. And of course they’re on different sides of this issue. MISHAL HUSAIN: Do you think it is fair that that’s more important today than solving the Western Sahara dispute? JAMES A. BAKER III: Well if you ask the average American they would say probably it is, because, the war on terror has to do with their own personal security and safety. And not with the difficulties and the difficult situation of some 200,000 refugees living in the desert in northern Algeria. MISHAL HUSAIN: If you look at it from the Sahrawi perspective they might think, what was the advantage for us in giving up the arms struggle. We were promised a referendum and it hasn’t happened. MISHAL HUSAIN: That might be the lesson they take away from it. JAMES A. BAKER III: That very well might be. Certainly. MISHAL HUSAIN: And how do you feel about that? JAMES A. BAKER III: Certainly might be. That would be a conclusion you could understand them arriving at, couldn’t you? For 10 or 11 years Morocco said publicly and privately that she wanted the settlement plan and wanted this referendum and then toward the very end, right after the voter list had been made, the voters had been identified, she said, Well, it’s no longer applicable; we’re not going to go forward with the settlement plan. MISHAL HUSAIN: Do you think armed hostilities could resume then? JAMES A. BAKER III: I don’t know. I have no idea. I think that’s an issue probably that is more on the plate of Algeria than anybody else because it isn’t going to resume unless Algeria permits it to happen. As long as Algeria says to the POLISARIO you’re not going to fight anymore then they’re not going to fight anymore. MISHAL HUSAIN: Because there are these reports of frustration in the camps understandably perhaps…. JAMES A. BAKER III: Sure, understandably. MISHAL HUSAIN: But they’re still waiting. JAMES A. BAKER III: Sure because they were promised a referendum. The other side agreed to it right up to the very point of the referendum and then backed out. And then you had the plan I put on the table which got the unanimous support of the Security Council, 15 to nothing and it was then rejected by Morocco. So I’m sure the Sahrawi are going to say, wait a minute, what do we have to do here to get a shot at self-determination? What do we have to do? We’ve said we’ll include — well, they didn’t say this, I did — we’ll include all of the people in Western Sahara as voters in the self-determination referendum. And the Moroccans are evidently even afraid of that. MISHAL HUSAIN: And what would you say in answer to that question? What do they have to do to get anywhere with their dispute? JAMES A. BAKER III: Well, the future with respect to that doesn’t look very bright is what I will say. We’ve tried almost everything I know how to try. Now as I told you earlier in the interview there’s no action forcing event. If there’s no conflict, if there’s no pressure for a settlement or for a referendum or even for autonomy, the Moroccans have talked about being willing to offer autonomy but they’ve never been willing to put a proposal on the table. They’ve simply said that they’re willing to negotiate on autonomy arrangement. MISHAL HUSAIN: And what was it like for you or what is it like for you now to look at this — and you spent seven years on this dispute, do you feel it was a waste? JAMES A. BAKER III: No, I don’t think it was a waste at all. I think at least we know now where the parties really stand. We know what might or might not be doable, because the fact that I was the personal envoy for a while brought a little attention to the conflict. But I can’t think of anything more that I would do. MISHAL HUSAIN: Do you think it is solvable? There is something that can be done? JAMES A. BAKER III: Well I think any dispute like this is solvable given goodwill on the part of both parties but you haven’t had that. If you don’t have that, if they’re not willing to exercise the political will necessary to reach a solution and the Security Council is not willing to move from Chapter 6, that is consensus, to Chapter 7 where they can ask the parties, force the parties, one or both of them, to do something they don’t want to do. Then I don’t know where the solution comes from. This issue is really not unlike the Arab-Israeli dispute: two different peoples claiming the same land. One is very strong, one has won the war, one is in occupation and the other is very weak. MISHAL HUSAIN: How does all of this then leave you feeling about the U.N. and conflict resolution? What is your experience of being involved as a U.N. envoy leave you feeling about that as a forum for dispute resolution? JAMES A. BAKER III: I think with the U.N. what you get is the lowest common denominator because you have 15 countries on the Security Council — and I would remind you that the United Nations has only functioned the way the founders intended one time and that was when it voted 12 to 3 to authorize the use of force to kick Iraq out of Kuwait which was a resolution that I worked on as Secretary of State and that we got. That’s the only time it’s ever done that. Any other time they want the parties to get together and agree. And some of these issues and conflicts are very difficult to resolve by consensus. MISHAL HUSAIN: But it’s the only forum we’ve got, really, or the best forum for dealing with this kind of thing? JAMES A. BAKER III: Well I think probably for this, yes. The Sahrawi will tell you that this is the last de-colonization issue facing the United Nations. And the majority of the General Assembly would probably so vote because, when the Spanish pulled out they never determined — there was never a determination of who would have sovereignty over what used to be Spanish Sahara. Same problem that you have with the Arab-Israeli dispute. MISHAL HUSAIN: … during your time in office, and it’s still there today. JAMES A. BAKER III: I have a lot of thoughts about that, that I will share with you at some other occasion. MISHAL HUSAIN: But your reflections on being Secretary of State in a different era, obviously Arab-Israeli issue is one that’s still there today? JAMES A. BAKER III: Sure it’s still there today. MISHAL HUSAIN: Overall, you were Secretary of State at a time when the Cold War was coming to an end. Today we live in an age of the war on terrorism. JAMES A. BAKER III: Right. MISHAL HUSAIN: How different are the challenges? JAMES A. BAKER III: Well, I think the challenges are significantly different frankly. We were dealing with nation states. We were dealing, as you point out, with the Cold War. I was the last, I guess, Cold War Secretary of State of the United States, and the Cold War ended sort of on our watch. And I’ll tell you when it ended, in my view, was right after Iraq invaded Kuwait and I met in a Moscow airport with Edward Shevardnadze who was the Foreign Minister of the Soviet Union. We stood shoulder to shoulder and condemned the actions of Iraq, which was a Soviet client state. Now you see that happening, you’ve got to know that the Cold War is over. MISHAL HUSAIN: Today it’s a different thing. JAMES A. BAKER III: Maybe easier in the sense of knowing who your enemy was and knowing what your policy should be. In the Cold War it was sort of simple. If the Soviets were for it, we were against it. And if we were for it, they were against it. And today it’s a little bit more difficult. But that issue is not involved really in this Western Sahara dispute. MISHAL HUSAIN: Yes. Let me just ask you for a moment though about your theories about conflict resolution and what works and what doesn’t. Is the lesson then the only thing that works is where there is a will otherwise perhaps you needn’t bother? JAMES A. BAKER III: If you’re going to say that you have to resolve the conflict by consensus agreement between the parties then the parties have got to want to resolve it. And there really should be some outside action forcing events that lead them to that objective. If, on the other hand, you can persuade let’s say, the Security Council as we did in the lead up to the Gulf War to use its Chapter 7 powers to impose upon one party or the other or ask one party or the other to do something they would not otherwise voluntarily agree to do, that’s a little different. And it’s easier to resolve a conflict when you have that power and that ability behind you. JAMES A. BAKER III: Quite true. MISHAL HUSAIN: The Arab-Israeli conflict was one. JAMES A. BAKER III: That’s very true, but I’ve already mentioned to you the difficult problem the United States has here because it has two countries that are cooperating with it in the war on terror with which it wants to stay on good relations — both Algeria and Morocco. JAMES A. BAKER III: So that’s why the 101st airborne isn’t going to go in and require self-determination in the Western Sahara. MISHAL HUSAIN: And that’s the reality of the world we live in? JAMES A. BAKER III: That’s a fact of life and it’s an understandable fact, I think, quite understandable. The same thing is true with respect to the Arab-Israeli dispute. The United States will seek to be and is the indispensable honest broker and mediator, but that dispute is not going to be resolved through the unilateral or the use of American military power. It is not. MISHAL HUSAIN: So what would you say to the Sahrawi today, because in the film we see people like Ahmed dreaming of their old homes, their homes on the coast, their memory of water? Is it a dream that’s worth keeping alive? JAMES A. BAKER III: It’s a very difficult, very, very difficult situation. As I began to mention early on in our session here that we now have some family visits going back and forth, which have been, depending on who you ask, very successful. It’s reuniting people who live in the camps for 26, 27 years with family members who now live in the territory. The Sahrawi think that those family visits are extraordinarily helpful and successful. I’m not sure the Moroccans feel that way. MISHAL HUSAIN: But would you say there’s still hope for the Sahrawi? JAMES A. BAKER III: Well I think as long as the issue remains unresolved yes, I think there’s hope. I think there’s hope because I don’t know of hardly any country in the world that as a matter of international law, international recognition, recognizes Morocco’s claim to the Sahara. Morocco needs to have international legitimacy attached to its claim. And that’s why it’s very much in Morocco’s interest to find a way to work this thing, to work this thing out. It’s obviously in the interest of these poor Sahrawi refugees who are living in the desert in very, very harsh conditions in northern Algeria. JAMES A. BAKER III: Well Algeria will tell you that they’re interested only in one thing and that is that the Sahrawi people have a right to exercise their right of self-determination. But they have an interest as well in getting this matter settled because until it is settled, there’s going to be a conflict between Algeria and Morocco with respect to this issue. It’s going to affect the Maghreb generally. You cannot, you will not get the economic development in the Maghreb that you would get if there were a settlement of the Western Sahara issue. MISHAL HUSAIN: And when you look at Morocco and its attitude perhaps all along, wouldn’t it also like to see a settlement to this just so that we don’t have this situation of it being constantly talked about, the Western Sahara? JAMES A. BAKER III: Sure, it’s very important for Morocco to find a resolution of this issue so that international legitimacy can attach to its claim. So its claim to Western Sahara would be recognized by other governments. And that’s why it’s very much in Morocco’s interest at the very least to offer some meaningful proposals on autonomy for or self-government for these people. And yet they’ll get right up to the bar, they’ll talk about wanting to grant autonomy, but they’re never willing to put an autonomy plan on the table. MISHAL HUSAIN: Why is this territory so important to Morocco? JAMES A. BAKER III: It’s a big political issue within Morocco. It’s a very emotional issue. Morocco has claims going way back many, many years to this territory. Claims that are based on things that happened in the past. On the other hand, the international court of justice has considered the matter and said that there’s no basis on which to rule and that Morocco is entitled to sovereignty over the territory. And so that’s the fundamental problem here. You have two different people claiming the same land. MISHAL HUSAIN: Do you blame the Moroccans? Do you think that they kept moving the goal post in this dispute? JAMES A. BAKER III: Well I haven’t said they kept moving the goal post but they did agree with Javier Perez de Cuellar, the former Secretary General of the United Nations, that they would implement the settlement plan that he put on the table. And for 10 or 11 years, even two or three years during my tenure we took steps to implement that plan. And when we got right up to having identified the people who were entitled to vote, the Moroccans then walked away from the plan. Why did they do that? You’ll have to ask them but I would assume it was because they were worried that they wouldn’t win the vote. MISHAL HUSAIN: That must be very frustrating for you? JAMES A. BAKER III: Well I kept telling the king, particularly King Hassen, I said, Your Majesty, if you don’t want the settlement plan don’t say you want it because I think we’re going to be able to deliver it. And they kept professing to want it, not just the king but all of his courtiers as well. MISHAL HUSAIN: Amid all of this the reality on the ground is that there’s this massive dividing wall, this territorial wall that Moroccans built on the Western Sahara. It’s longer than the Great Wall of China. Amid that reality on the ground how much harder does it make the chances of settling it on paper? JAMES A. BAKER III: Well they built the sand wall way back in ’86, ’87 sometime. I remember being the representative of the United States of America on the throne day, the celebration of the day that his majesty King Hassen took the throne. And as I was meeting with him prior to returning to the United States he asked me if I could help him with some intelligence involving the wall. And I came back to Washington and put the request in and we got some overhead intelligence to help Morocco with respect to the wall. Now that was back in the days of the Cold War when the POLISARIO Front was aligned with Cuba and Libya and some other enemies of the United States, and Morocco was very close to the United States. MISHAL HUSAIN: But it’s not helpful to the dispute resolution — the fact that it exists? JAMES A. BAKER III: Well the wall is helpful in terms of keeping conflict down because it makes it more difficult. If the POLISARIO were inclined to begin to fight again, for instance, it would be much more difficult with that wall there. But the wall does rule off a certain amount of Western Sahara, which is not under Moroccan control, the so-called — what the Sahrawi refer to as the liberated part of Western Sahara. MISHAL HUSAIN: And it clearly becomes a hated symbol for the Sahrawi. JAMES A. BAKER III: It sure does. Sure. MISHAL HUSAIN: Let’s talk about the Sahrawi for a minute and their own need for legitimacy. They’ve been living in these refugee camps for almost 30 years. How long is that going to happen? Is that just the reality of their life? JAMES A. BAKER III: Well I don’t know, it depends on whether or not the geopolitical situation changes in a way that would present some opportunity to resolve this problem. The Algerians and others presented me with a white paper — a non-paper really — suggesting a division of the territory, something that the Moroccans had agreed to back in 1976 with Mauritania. There was a division of the territory between Mauritania and Morocco. Morocco today says that all of the Sahara is ours, we will never agree to any division or any partition. They wouldn’t even discuss the proposal. And maybe somewhere down the line years from now if the situation changes or the geopolitics change, it may be that that would be a solution that ought to be looked at again. MISHAL HUSAIN: But it would mean an end to the dream of the Sahrawi for their homeland? JAMES A. BAKER III: Not necessarily it would give them a homeland if it were a division of a portion of what is now Western Sahara because both parties have a claim to this land. The Sahrawi have a claim to it having been the indigenous people who were there when the Spanish pulled out but years before that of course Morocco claimed the territory or at least a large part of it. So they’re conflicting claims. The international court of justice was not willing to come down on one side or the other with respect to those. MISHAL HUSAIN: Secretary Baker, our thanks to you for being on WIDE ANGLE. JAMES A. BAKER III: You’re sure welcome. Photo Essay: Who are the Sahrawi?